The impact of the Opioid Epidemic has been apparent throughout the state of Maine. 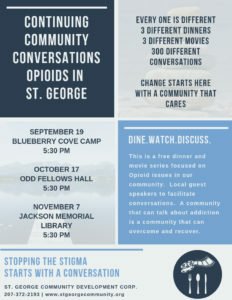 The Opioid Awareness Working Group of the Community Development Corporation, led by Bruce Hodsdon, of Coastal Recovery Community Center, has been discussing and identifying the opioid issue in St. George for almost a year. We have reviewed and discussed the State’s suggested action plan for towns to deal with the opioid epidemic on a local level, we have discussed what other towns are doing to create change and support their communities, and now we want to have conversations with you; the residents of St. George. We hope you’ll join us to share your thoughts, your experiences, and ask questions at one or all of our dinner and movie series. While many don’t like to discuss the impact on our villages in St. George, it is time to bring the opioid conversation out into the light. If we can all learn to talk about addiction without shame, if we can love, appreciate and support our neighbors, we can be sure that our community and the individuals who make up our community will thrive through difficult times. A community that cares is a community that can overcome.